Rabbit anti Human, Mouse IRS1. 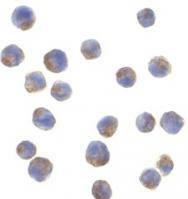 IRS-1 antibody was raised against a 16 amino acid peptide from near the center of human IRS-1. Western blot: 1 - 2 μg/ml. 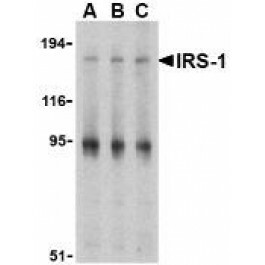 Following tyrosine phosphorylation, the insulin receptor substrate 1 and 2 (IRS-1 and IRS-2) can form a protein scaffolding for the assembly of a host of Src homology 2 (SH2) domain-containing proteins (1). IRS-1 tyrosine phosphorylation can occur through the activity of several cytokine and growth factor receptors such as interleukin (IL)-4, IL-9, interferon-?, in addition to the insulin and insulin-like growth factor 1 receptors (2). The scaffolding provided by IRS-1 and IRS-2 is necessary for insulin signal transduction across the cell membrane. IRS-1 tyrosine phosphorylation, and thus formation of the IRS scaffolding is inhibited by tumor necrosis factor (TNF), and this inhibition can itself be blocked by rapamycin, an inhibitor of the mammalian target of rapamycin (TOR) (3,4). TNF activity could also be blocked by inhibition of the Akt kinase and the PTEN tumor suppressor, suggesting that TNF impairs insulin signaling through IRS-1 by activation of the TOR signaling pathway (3). Giovannone B, Scaldaferri ML, Federici M, Porzio O, Lauro D, Fusco A, et al. Insulin receptor substrate (IRS) transduction system: distinct and overlapping signaling potential. Diabetes Metab Res Rev. 2000 Nov-Dec;16(6):434-41. PubMed PMID: 11114102. Waters SB, Pessin JE. Insulin receptor substrate 1 and 2 (IRS1 and IRS2): what a tangled web we weave. Trends Cell Biol. 1996 Jan;6(1):1-4. PubMed PMID: 15157524. Shamji AF, Nghiem P, Schreiber SL. Integration of growth factor and nutrient signaling: implications for cancer biology. 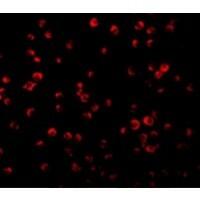 Mol Cell. 2003 Aug;12(2):271-80. PubMed PMID: 14536067.